On hearing the first cuckoo in Spring, performed by the Royal Philharmonic Orchestra, conducted by Sir Thomas Beecham; courtesy of EMI Music Ltd. The 29th January 2012 marked the 150th Anniversary of the birth of the composer Frederick Delius in Bradford and 2012 also marks the Centenary of one of his most celebrated compositions, ‘On Hearing the First Cuckoo in Spring’. Music texts will tell you that this composition was written at Delius’s French home at Grez-sur-Loing near Fontainebleau, set to the Norwegian folk tune ‘I Ola-Dalom’. This is not the whole story. 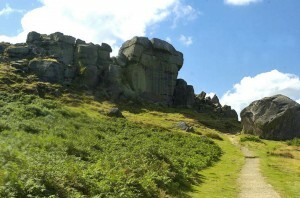 The Delius family took their holidays at Ilkley in West Yorkshire, England, and from there Frederick rode a pony, walked with his dog, sister Clare and friends over Ilkley Moor. There are accounts of him standing stock still and listening to birdsong on these walks. It was as though he was drinking in and storing the sight, sound and smell of the Moors. If there was a first place he heard a cuckoo, it would probably have been on these Moors. Maybe a cuckoo heard in his French garden brought back memories of childhood moorland walks and that first cuckoo in spring. As a child I listened to a radio programme on Bradford which assumed that a fourteen year old Frederick and siblings took a walk from Saltaire, skirted Eldwick and crossed Ilkley Moor. The writer of this programme assumed that on this visit to the Moors, Delius heard and later wrote down a notation for the cuckoo. Her assumptions may have been based on contact with the Delius family, at that time there were still living relatives in the area. I took particular note of this as it was my own favourite walk. The poem stems from my own childhood walks and follows the route suggested by the radio programme. The cuckoo has a dual significance, it is a herald of spring but also a cry of betrayal, being associated in earlier times with the term cuckold. Chetham School of music in Manchester are celebrating with a season of concerts and events. Follow this link for their programme. Some interesting articles about the composer’s life in Bradford can be found on the Telegraph & Argus site. The Delius society website is also worth looking at.